This article is about flat Earth societies. For the Belgian band, see Flat Earth Society (band). Projections of the sphere like this one have been co-opted as images of the flat Earth model depicting Antarctica as an ice wall surrounding a disk-shaped Earth. An animation of 22 images taken by the Earth Polychromatic Imaging Camera on the Deep Space Climate Observatory from the L1 Lagrangian point between the Earth and the Sun on 29 May 2016, showing a globe-shaped Earth rotating once a day. Modern flat Earth societies are organizations that promote the misconception that the Earth is flat rather than a globe. Such groups date from the middle of the 20th century; some adherents are serious and some are not. Those who are serious are often motivated by pseudoscience or Biblical literalism. Through the use of social media, flat Earth theories have been increasingly espoused by individuals unaffiliated with larger groups, many of which have members from several countries. Modern flat Earth belief originated with the English writer Samuel Rowbotham (1816–1884). Based on conclusions derived from the Bedford Level experiment, Rowbotham published a pamphlet Zetetic Astronomy. He later expanded into a book Earth Not a Globe, proposing the Earth is a flat disc centred at the North Pole and bounded along its southern edge by a wall of ice, Antarctica. Rowbotham further held that the Sun and Moon were 3,000 miles (4,800 km) above Earth and that the "cosmos" was 3,100 miles (5,000 km) above the Earth. He also published a leaflet titled The inconsistency of Modern Astronomy and its Opposition to the Scriptures, which argued that the "Bible, alongside our senses, supported the idea that the earth was flat and immovable and this essential truth should not be set aside for a system based solely on human conjecture". Rowbotham and followers like William Carpenter gained attention by successful use of pseudoscience in public debates with leading scientists such as Alfred Russel Wallace. Rowbotham created a Zetetic Society in England and New York, shipping over a thousand copies of Zetetic Astronomy. After Rowbotham's death, Lady Elizabeth Blount established a Universal Zetetic Society, whose objective was "the propagation of knowledge related to Natural Cosmogony in confirmation of the Holy Scriptures, based on practical scientific investigation". The society published a magazine, The Earth Not a Globe Review, and remained active well into the early 20th century. A flat Earth journal, Earth: a Monthly Magazine of Sense and Science, was published between 1901–1904, edited by Lady Blount. In 1956, Samuel Shenton created the International Flat Earth Research Society as a successor to the Universal Zetetic Society, running it as "organising secretary" from his home in Dover, England. Given Shenton's interest in alternative science and technology, the emphasis on religious arguments was less than in the predecessor society. When satellite images showed Earth as a sphere, Shenton remarked: "It's easy to see how a photograph like that could fool the untrained eye". Later asked about similar photographs taken by astronauts, he attributed curvature to the use of wide-angle lens, adding, "It's a deception of the public and it isn't right". In 1969, Shenton persuaded Ellis Hillman, a Polytechnic of East London lecturer, to become president of the Flat Earth Society; but there is little evidence of any activity on his part until after Shenton's death, when he added most of Shenton's library to the archives of the Science Fiction Foundation he helped to establish. Historical accounts and spoken history tell us the Land part may have been square, all in one mass at one time, then as now, the magnetic north being the Center. Vast cataclysmic events and shaking no doubt broke the land apart, divided the Land to be our present continents or islands as they exist today. One thing we know for sure about this world...the known inhabited world is Flat, Level, a Plain World. -Flyer written by Charles K. Johnson, 1984. Shenton died in 1971. Charles K. Johnson inherited part of Shenton's library from Shenton's wife, and established and became president of the International Flat Earth Research Society of America and Covenant People's Church in California. Over the next three decades, under his leadership, the Flat Earth Society grew to a reported 3,500 members. Johnson issued many publications and handled all membership applications. The most famous publication was Flat Earth News, a quarterly, four-page tabloid. Johnson paid for these publications through annual member dues costing US$6 to US$10 over the course of his leadership. Johnson cited the Bible for his beliefs, and he saw scientists as pulling a hoax which would replace religion with science. The Flat Earth Society's most recent planet model is that humanity lives on a disc, with the North Pole at its centre and a 150-foot (45 m) high wall of ice, Antarctica, at the outer edge. The resulting map resembles the symbol of the United Nations, which Johnson used as evidence for his position. In this model, the Sun and Moon are each 32 miles (52 km) in diameter. Flat Earth Society recruited members by speaking against the US government and all its agencies, particularly NASA. Much of the society's literature in its early days focused on interpreting the Bible to mean that the Earth is flat, although they did try to offer scientific explanations and evidence. Eugenie Scott called the group an example of "extreme Biblical-literalist theology: The earth is flat because the Bible says it is flat, regardless of what science tells us". According to Charles K. Johnson, the membership of the group rose to 3,500 under his leadership, but began to decline after a fire at his house in 1997 which destroyed all of the records and contacts of the society's members. Johnson's wife, who helped manage the membership database, died shortly thereafter. Johnson himself died on 19 March 2001. In 2004, Daniel Shenton (not related to Samuel) resurrected the Flat Earth Society, basing it around a web-based discussion forum. This eventually led to the official relaunch of the society in October 2009, and the creation of a new website, featuring a public collection of flat Earth literature and a wiki. Moreover, the society began accepting new members for the first time since 2001, with musician Thomas Dolby becoming the first to join the newly reconvened society. As of July 2017[update], over 500 people have become members. In 2013, part of this society broke away to form a new web-based group also featuring a forum and wiki. Flat Earth Society of Canada was established on 8 November 1970 by philosopher Leo Ferrari, writer Raymond Fraser and poet Alden Nowlan; and was active until 1984. Its archives are held at the University of New Brunswick. Calling themselves "planoterrestrialists", their aims were quite different from other flat Earth societies. They claimed a prevailing problem of the new technological age was the willingness of people to accept theories "on blind faith and to reject the evidence of their own senses." The parodic intention of the Society appeared in the writings of Ferrari, as he attributed everything from gender to racial inequality on the globularist and the spherical Earth model. Ferrari even claimed to have nearly fallen off "the Edge" of the Earth at Brimstone Head on Fogo Island. Ferrari was interviewed as an "expert" in the 1990 flat Earth mockumentary In Search of the Edge by Pancake Productions (a reference to the expression "as flat as a pancake"). In the accompanying study guide, Ferrari is outed as a "globularist," a nonce word for someone who believes the Earth is spherical. The real intent of the film, which was part-funded by the Ontario Arts Council and National Film Board of Canada, was to promote schoolchildren's critical thinking and media literacy by "[attempting] to prove in convincing fashion, something everyone knew to be false." Multi-media artist Kay Burns re-created the Flat Earth Society of Canada as an art project with her alter ego Iris Taylor as its president. Burns created an installation entitled the Museum of the Flat Earth, which included some artifacts from the 1970 group. It was exhibited in 2016 at the Flat Earth Outpost Café in Shoal Bay, Newfoundland. Richard A. Lupoff's novel Circumpolar! (1984) describes a flat Earth, with a hole at the centre instead of a North Pole, and the underside contains fictional lands such as Atlantis and Lemuria. California-based punk rock band Bad Religion include a song titled "Flat Earth Society", by Brett Gurewitz, on their album Against the Grain (1990). A prominent feature of the song is the refrain "lie, lie, lie," indicating a strong denunciation of the society and its theories. In 1984, English musician Thomas Dolby released an album called The Flat Earth. This became the name for his fan club and subsequent website forums. Daniel Shenton credited this album as his introduction to the theory, and offered the first membership of the reopened Society. Dolby, while not a believer, accepted. Terry Pratchett's commercially successful series of Discworld novels take place on a flat Earth balanced on the backs of four elephants standing on a giant turtle swimming through space. In 2013, while discussing the importance of acting on climate change, President Barack Obama said there was no time for "a meeting of the Flat-Earth Society" in reference to climate change deniers. Rapper B.o.B composed a song titled "Flatline", in which he claims the Earth is flat, and promotes other conspiracy theories. He was offered, and accepted, membership in the Flat Earth Society. Steve Jackson Games featured The Flat Earth Society in their Illuminati Card Game. All-Star NBA point guard, Kyrie Irving, has made public claims that he believes the Earth is flat. Irving made headlines when discussing conspiracy theories with Richard Jefferson and Channing Frye, two of his former teammates. He tells them "The Earth is flat. The Earth is flat... it's right in front of our faces. I'm telling you it's right in front of our faces. They lie to us." He claims that he has done extensive research on the topic and knows the science behind it in which has led him to believe this social phenomenon. Irving has since retracted the comments. In 2018, Netflix released the documentary Behind the Curve, which follows prominent modern flat-Earthers Mark Sargent and Patricia Steere, as well as astrophysicists and psychologists who attempt to explain the growing fad. In the Internet era, the availability of communications technology and social media like YouTube, Facebook and Twitter have made it easy for individuals, famous or not, to spread disinformation and attract others to their erroneous ideas. One of the topics that has flourished in this environment is that of the flat Earth. 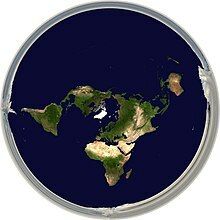 Modern flat-earthers generally embrace some form of conspiracy theory out of the necessity of explaining why major institutions such as governments, media outlets, schools, scientists, and airlines all assert that the world is a sphere. They tend to not trust observations they have not made themselves, and often distrust or disagree with each other. Based on the speakers at the 2018 UK's Flat Earth UK Convention, believers in a flat Earth vary widely in their views. While most agree upon a disc-shaped Earth, some are convinced the Earth is diamond-shaped. Furthermore, while most believers do not believe in outer space and none believe mankind has ever traveled there, they vary widely in their views of the universe. The solar eclipse of 21 August 2017 gave rise to numerous YouTube videos purporting to show how the details of the eclipse prove the Earth is flat. Also in 2017, "the Tunisian and Arab scientific and educational world" had a scandal when a PhD student submitted a thesis "declaring Earth to be flat, unmoving, young (only 13,500 years of age), and the centre of the universe". In the end that is the core malfunction of the flat-earthers, and the modern populist rejection of expertise in general. It is a horrifically simplistic view of the world that ignores (partly out of ignorance, and partly out of motivated reasoning) to real complexities of our civilization. It is ultimately lazy, childish, and self-indulgent, resulting in a profound level of ignorance drowning in motivated reasoning. The British skeptical activist Michael Marshall attended the UK's annual Flat Earth UK Convention on 27–29 April 2018 and noted disagreement on several views of the believers in a flat Earth. To Marshall, one of the most telling moments at the convention was the "Flat Earth Addiction" test that was based on a checklist used to determine whether someone is in a cult, without the convention attendees realizing the possibility of themselves being in a cult. Organizations skeptical of fringe beliefs have occasionally performed tests to demonstrate the local curvature of the Earth. One of these, conducted by members of the Independent Investigations Group, at the Salton Sea on June 10, 2018, was attended also by supporters of a flat Earth, and the encounter between the two groups was recorded by the National Geographic Explorer. This experiment successfully demonstrated the curvature of the earth via the disappearance over distance of boat-based and shore-based targets. Mike Hughes, a daredevil and flat-Earth conspiracy theorist, used a homebuilt manned-rocket in an attempt to see for himself if the Earth is flat on March 24, 2018. His rocket made of scrap metal was estimated to cost $20,000, and using a mobile home as a custom launchpad managed to climb 1,875 feet with Hughes inside and ended with a hard landing but with parachutes successfully deploying. The amateur rocketeer was not seriously injured and remains firm in his flat Earth beliefs. He claims that real evidence will come with "larger rockets". ^ a b c d Schadwald, Robert J. (July 1980). "The Flat-out Truth:Earth Orbits? Moon Landings? A Fraud! Says This Prophet" (PDF). Science Digest. ^ a b Schick, Theodore; Vaughn, Lewis (1995). How to think about weird things: critical thinking for a new age. Houghton Mifflin. p. 197. ISBN 978-1-55934-254-4. ^ a b Ambrose, Graham. "These Coloradans say Earth is flat. And gravity's a hoax. Now, they're being persecuted". The Denver Post. Retrieved 19 August 2017. ^ a b Dure, Beau. "Flat-Earthers are back: 'It's almost like the beginning of a new religion'". The Guardian. Retrieved 19 August 2017. ^ Nature 7 April 1870. ^ "The Form of the Earth—A Shock of Opinions" (PDF). The New York Times. 10 August 1871. Retrieved 2 November 2007. ^ Hampden, John (1870): The Bedford Canal swindle detected & exposed. A. Bull, London. ^ a b Moore, Patrick (1972). "Better and Flatter Earths" (PDF). Can You Speak Venusian?. ISBN 0-352-39776-4. ^ Schadewald, RJ. "Six "flood" arguments creationists can't answer". National Center for Science Education. Retrieved 24 April 2010. ^ "Documenting the Existence of 'The International Flat Earth Society'". talk.origins. Retrieved 26 December 2013. ^ a b Martin, Douglas (25 March 2001). "Charles Johnson, 76, Proponent of Flat Earth". The New York Times. Retrieved 27 December 2013. ^ Voliva, Wilbur Glenn (March 1979). "Is the Earth a Whirling Globe?" (PDF). Flat Earth News. Lancaster, CA: International Flat Earth Research Society. p. 2. ^ Johnson, Charles K. (December 1978). "Flat Earth News: News of the World's Children" (PDF). Lancaster, California: International Flat Earth Research Society. p. 2. ^ Johnson, Charles K. (December 1978). "Sun is a light 32 miles across" (PDF). Flat Earth News. Lancaster, California: International Flat Earth Research Society. p. 1. Retrieved 1 January 2018. ^ Scott, Eugenie (1997). "Antievolution and Creationism in the United States" (PDF). Annual Review of Anthropology. 26: 263–289. doi:10.1146/annurev.anthro.26.1.263. Archived from the original (PDF) on 5 June 2012. Retrieved 8 December 2011. ^ Cole, John R. (2001). "Flat Earth Society President Dies". National Center for Science Education. Retrieved 15 June 2009. ^ "Miedo a un planeta esférico". 19 March 2010. Retrieved 21 July 2012. ^ "The Flat Earth Society forum". Retrieved 24 July 2014. ^ "Relaunch of the Flat Earth Society (press release)" (PDF). ^ "The Flat Earth Society Homepage". Retrieved 24 July 2014. ^ a b Adam, David (23 February 2010). "The Earth is flat? What planet is he on?". The Guardian. ^ "The Flat Earth Society – Membership Register". theflatearthsociety.org. Retrieved 23 July 2014. ^ "The Flat Earth Society". Retrieved 14 July 2014. ^ "Leo Charles Ferrari". New Brunswick Literary Encyclopedia. St. Thomas University. Retrieved 16 March 2013. ^ a b "Series No. 2 The Flat Earth Society of Canada". Leo C. Ferrari Fonds. UNB Archives and Special Collections. Retrieved 16 March 2013. ^ a b c Bird, Lindsay (20 May 2016). "Museum of the Flat Earth opens on (where else?) Fogo Island". Canadian Broadcasting Corporation. Retrieved 8 May 2017. ^ "Dr. Ferrari and the Flat Earth Society by Alden Nowlan". Retrieved 7 February 2013. ^ Ferrari, Leo Charles (1975). "Feminism and education in a Flat Earth perspective". McGill Journal of Education. X (1): 77–81. ^ Colombo, John R (1984). Canadian Literary Landmarks. Dundurn. p. 19. ISBN 978-0888820730. ^ a b Barrie, Scott (Director); Marsh, Robert (Narrator) (2005). In search of the edge : an inquiry into the shape of the earth and the disappearance of Andrea Barns (DVD). Toronto, Ontario: Pancake Productions. ISBN 9781594582295. OCLC 81094526. ^ "In Search of the Edge An Inquiry into the Shape of the Earth and the Disappearance of Andrea Barns". Bullfrog Films. Retrieved 8 May 2017. ^ "Flat Earth Society". Iris Taylor Research. Retrieved 8 May 2017. ^ "Circumpolar! (Twin Planets, book 1) by Richard A Lupoff". Fantasticfiction.co.uk. Retrieved 28 June 2013. ^ ""Flat Earth Society" by Bad Religion". ^ Ian Stewart (16 July 2013). "The Science Behind Discworld's Flat Earth on the Back of a Turtle". Gizmodo. ^ O'Brien, Michael (25 June 2013). "Obama: No time for 'flat-earth society' on climate change". NBC News. Retrieved 27 December 2013. ^ Ellen Brait. "'I didn't wanna believe it either': Rapper BoB insists the Earth is flat". The Guardian. ^ Manon, Tiannon. "Flat Earthers: Dumb, Crazy or Just Free Thinkers?". Open Mic. Retrieved 28 July 2016. ^ The Flat Earth Society. "The Flat Earth Society Welcomes B.o.B." The Flat Earth Society. The Flat Earth Society. Retrieved 29 July 2016. ^ "Cavs' Kyrie Irving on 'Earth is flat' comments: 'I know the science'". ESPN.com. 18 February 2017. Retrieved 1 January 2019. ^ "Kyrie Irving on flat-Earth comments: 'I'm sorry'". NBA.com. Retrieved 1 January 2019. ^ Timmer, John (17 March 2019). "Behind the Curve a fascinating study of reality-challenged beliefs". Ars Technica. Retrieved 13 April 2019. ^ Abbott, Erica. "Mark Zuckerberg Banning All Flat Earth Groups from Facebook Is A Hoax". Business2community.com. Business2community. Archived from the original on 19 August 2017. Retrieved 19 August 2017. ^ Heigl, Alex. "The Short List of Famous People Who Think the Earth Is Flat (Yes, Really)". People. Retrieved 19 August 2017. ^ Herreria, Carla. "Neil deGrasse Tyson Cites Celebrity Flat-Earthers To Make A Point About Politics". HuffPost. Retrieved 19 August 2017. ^ Courtney Humphries (28 October 2017). "What does it take to believe the world is flat?". ^ a b Marshall, Michael. "The universe is an egg and the moon isn't real: notes from a Flat Earth conference". Science, Notes & Theories. The Guardian. Retrieved 16 September 2018. ^ Martin, Sean. "'The sun hologram needs updating' This is how flat earthers explain the solar eclipse". Daily Express. Retrieved 19 August 2017. ^ Hickey, Brian. "What do flat Earthers think about Monday's solar eclipse?". Phillyvoice.com. Philly Voice. Retrieved 19 August 2017. ^ Guessoum, Nidhal. "PhD thesis: The earth is flat". Gulf News. Retrieved 19 August 2017. ^ Novella, Steven (3 May 2018). "What the Flat-Earth Movement Tells Us". TheNess.com. NESS. Archived from the original on 5 May 2018. Retrieved 5 May 2018. ^ Underdown, James (2018). "Commentary: The Salton Sea Flat Earth Test: When Skeptics Meet Deniers". Skeptical Inquirer. 42 (6): 14–15. ^ Underdown, Jim. "The Salton Sea Flat Earth Test: When Skeptics Meet Deniers". CSICOP.org. CFI. Archived from the original on 24 February 2019. Retrieved 24 February 2019. ^ "Flat-earther blasts off in homemade rocket in bid to reassure himself world is shaped 'like a Frisbee'". The Independent. 25 March 2018. Retrieved 8 December 2018. ^ Nace, Trevor. "Flat Earth Rocket Man Finally Blasts Off In Homemade Rocket To Prove Earth Is Flat". Forbes. Retrieved 8 December 2018. Garwood, Christine (2007). Flat Earth: the History of an infamous idea. Macmillan. Graham Ambrose (7 July 2017). "These Coloradans say Earth is flat. And gravity's a hoax. Now they're being persecuted". The Denver Post.